Soy is among field herbs the most important protein-oil culture. Round soy grain (Galician hispid) can be of yellow color or of multi colors. 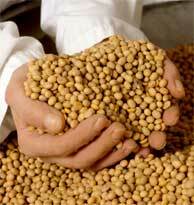 Soybean has a high calorific value (422Kcal/100g). Depending on sort, conditions and manner of growing, it contains-35-50% of proteins, 17-24% of oil, to 30 of carbohydrates and 4-7% of mineral materials. Soy contains very important biologically active materials, phosphatydes (fostatide) (2,5%) vitamin complex A and B, C, D, E macro elements(callyume oxide(kalium), calcium oxide, magnesium oxide, et. cetra) and micro elements(manganese , molibden(molibden, copper, bor). Proteins of soy are of high biological value and they contain amino acids: leucin, cistin tyrozin, triptofan, arginin, histidin and so on(leucin, cistin, tirozin, triptofan, arginin, histidin) . According to its amino acids composition of soy proteins seeds is similar to hen eggs protein. The usage: The soy has a very broad usage, like in nutrition of people and domestic animals, as well as in industrial processing. Soy can be used in manifold ways, practically the whole 100%. Storing conditions. For industrial processing soy is packed and delivered in begs or in bulk (rinfuse) It is stored and kept in storages, silos and other premises which are dry, clean and which can be easily ventilated. Transportation requirements. Transportation of soy is done in clean and closed wagons. Trucks, ships, river cargo floating means of transportations or by other corresponding means of transportations, which must not contain external smells, which soy can absorb. content of protein at least 34%. Goods must be followed by report of analyses performed by a competent person. Soy is followed by an evidence of GMO test performed.